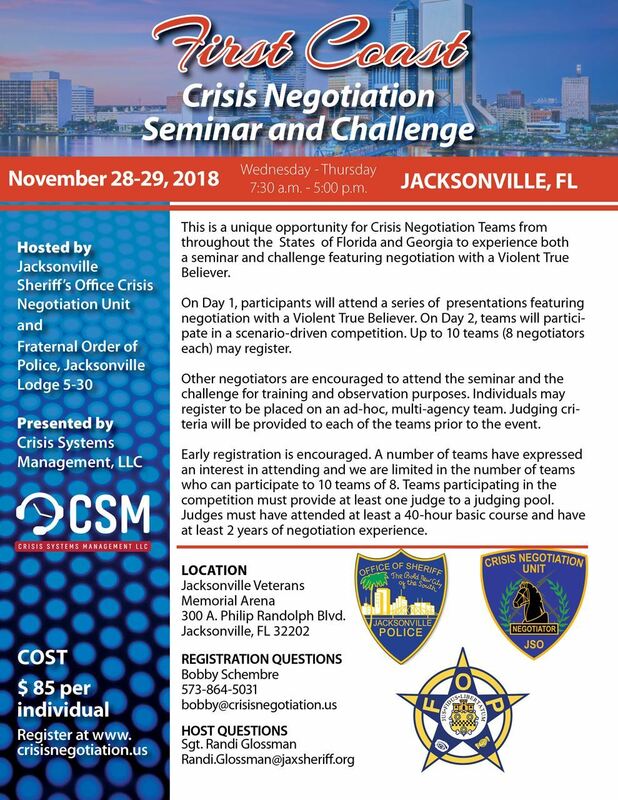 This Seminar and Challenge is being hosted by the Jacksonville Sheriff's Office Crisis Negotiation Unit and the Fraternal Order of Police Jacksonville Lodge 5-30. It is an opportunity for Crisis Negotiation Teams to experience both a seminar and a hands on application of crisis negotiation skills. On Day 1, participants will attend a series of presentations featuring negotiation with a Violent True Believer. On Day 2, teams will participate in a scenario-driven competition. ***NOTE: External Courses listed are not affiliated with FAHN. They are shown here as a courtesy and do not state or imply any guarantee or endorsement by FAHN. Registration for external courses is not facilitated by FAHN.